OnRobot is a Universal Robots+ partner delivering innovative Plug and Produce industrial robot grippers that aide manufacturers maximize the value of their collaborative robot investments, easy use, rapid ROI, and co-worker safety as they are employed alongside human workers. Mounted directly on the cobot arm these flexible grippers are so simple they can be programmed and used by factory floor staff, engineers are not needed. All of this speeds up application development and lowers an operation's time to market. Just as collaborative robots are relatively new to industry, so OnRobot with its purpose built collaborative grippers is a young company, founded in 2015. They have however quickly established themselves as the gripper of choice because of the innovative flexibility their product adds to the already innovative and flexible Universal Robot family of collaborative robots. Nothing short of true plug n play functionality is what OnRobot works to deliver. 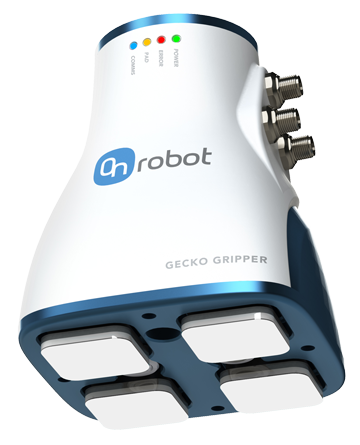 Once installed and functional, being safe, versatile, and always user-friendly is this industrial robot gripper product's aim. Staying customer-centric, OnRobot works to empower factory workers as they enhance their companies market share. HTE Automation and TECHTEAM supplies and applies the OnRobot family of robot grippers in Kansas, Missouri, and Illinois.